Angiology is the branch of medicine that deals with the study of the two areas of blood circulation: arterial and venous. The purpose of the visit is to cure an already-occurring disease but also to prevent potential, even fatal, complications of a vascular disease not yet evident. With the angiological visit, the physician analyzes the quality and functionality of blood and lymphatic vessels in order to detect the presence of evidence related to various pathologies. In the anamnesis stage, the angiologist collects the information needed to delineate the patient’s clinical situation of recent family, ongoing pharmacological and lifestyle disorders. Then, a phase of a true clinical investigation is followed, during which the physician investigates problems with the veins and the varices complained of by the patient: varicose, phlebitis, thrombophlebitis, arteropathies, and so on. If it’s necessary, for these exams, the angiologist uses special diagnostic tools such as doppler and ecodoppler. Exams do not require any kind of preparation. 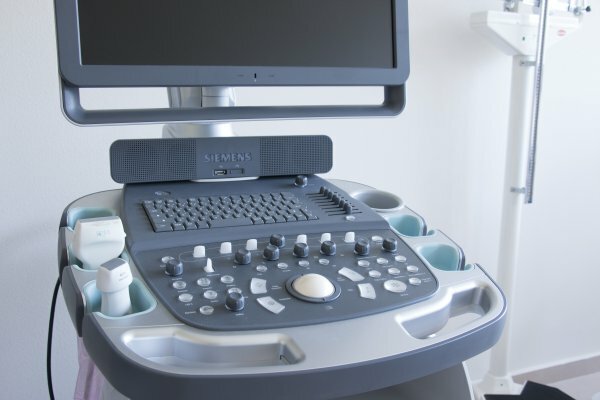 SIEMENS ACUSON X700 : Digital ultrasound created on the latest imaging technology, featuring a rich set of standard functions, with a multi-frequency doubler ecocolor module. In the angiology surgery, it is possible to perform diagnostic examinations and treatments for circulatory diseases (venous insufficiency, varicose veins, arterial diseases, carotid diseases, aneurysms and many others).